I grew up listening to Marv Albert broadcast New York Knicks basketball games, and I loved the smart, silky smooth delivery, and the shout of “Yes” that punctuated big baskets. But I learned recently in the HBO documentary, Glickman, that Albert, along with many of today’s seasoned play-by-play announcers in America, grew up listening to Marty Glickman. If you’ve ever heard an announcer of a basketball game say things like “baseline”, “front court”, “drive the lane”, that was because Glickman said it first, credited with creating the blueprint of the basketball court in the mind’s eye of the radio listener. And if you ever heard the word “swish” by a broadcaster after seeing a ball fall through the hoop without hitting the rim, that is because Glickman said it first. Marty Glickman is without a doubt a legend in the American sports broadcasting world. He was the voice of the Knicks, the football Giants and Jets, Yonkers Raceway, and a wide variety of sports for the fledgling cable network, Home Box Office (HBO). But the general public is not as aware that Glickman was a great athlete and Olympian. He was not only an Olympian, he was one thrust into the tricky geo-politics of how to handle Nazi Germany in the 1930s, before World War II raged. What is perhaps less well known is that the US had a chance to make the diversity pitch even stronger. 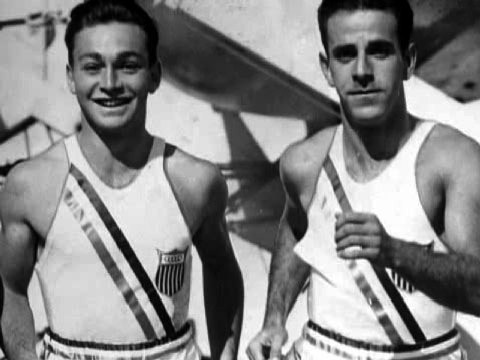 The track team had two Jews, the only Jews on the US Olympic squad: Sam Stoller and Marty Glickman. They flew into Germany in 1936, which at the time was said to actively discriminate against people of Jewish “blood”. In the documentary, Glickman talks about the day he got the horrible news – that he would not run in the 4×100 meter relays. The morning of the day we were supposed to run the trial heats, we were called into a meeting, the 7 sprinters, along with Dean Cromwell, the assistant head track coach head, and Lawson Robertson, the head track coach. And Robertson announced to the seven of us that he heard very strong rumors, that the Germans were saving their very best sprinters, hiding them to upset the American team in the 4×400 meter relay. And consequently, Sam and I, were to be replaced by Jesse Owens and Ralph Metcalfe. We were shocked. Glickman certainly had no grudge against Jesse Owens. In fact, he cited the fact that Owens stood up for Glickman and Stoller in that meeting. But he was shouted down, in no position to overrule the powerful coaches of the track team. I said, “Coach, you know, we’re the only two Jews on the track team, Sam and I.” “We’ll worry about that later,” said Dean Cromwell. Sam was completely stunned. He didn’t say a word in the whole meeting. I’m a brash 18-year-old kid, and I said, “Coach, no matter who runs this race we’re going to win by 15 yards!” At which point Jesse spoke up and said, “I’ve won my 3 gold medals. I’m tired. I’ve had it. Let Marty and Sam run. They deserve it.” And Cromwell pointed his finger at him and said, “You’ll do as you’re told.” And in those days, black athletes did as they were told. Glickman watched the finals in frustration and anger. “I look out on the track and I see Metcalfe passing runners down the backstretch. He ran the second leg. That should be me out there!” Adding a bit of levity to the moment was Lou Zamperini, the famed Olympian whose incredible story was told in the book and film, Unbroken. He said, “With Glickman in there, they wouldn’t have won by 15 yards. Maybe 14 yards.” As it turned out, the Germans had no secret sprinters waiting in the wings, finishing third well over a second behind. Glickman has always believed that anti-semitism was at the heart of leaving Glickman and Stoller off the team. As he stated in this clip, it was easier for the Americans to navigate the tricky diplomacy ins and outs with the emerging Nazi power in Europe by keeping Jewish athletes out of the competition. Here were the great black athletes who couldn’t be kept off the winning podium. They were marvelous. But here were two rather obscure Jewish American athletes who could be kept from the winning podium so as not to further embarrass Adolph Hitler. Glickman would go on to say that his victimization on the track was nothing compared to what happened to Jews during the war. But being kept off the track in 1936 was a painful memory he took to his grave, when he passed away in January, 2001. According to this obituary in The New York Times, the US Olympic Committee (USOC) eventually did admit, indirectly, that Glickman and Stoller were likely kept off the track to appease Hitler. While not finding written proof that the U.S.O.C. kept Glickman and Stoller out of the relay because of anti-Semitism, William J. Hybl, then president of the Olympic group, said in 1998: ”I was a prosecutor. I’m used to looking at evidence. The evidence was there.” That year, the U.S.O.C. presented Glickman a plaque in lieu of the gold medal he most likely would have won even if Owens and Metcalfe had not raced. Stoller died in 1983. Posted in Geo-politics, Other Olympics, Track and FIeld and tagged 1936 Berlin Olympics, Archie Williams, Foy Draper, Frank Wykoff, Glickman HBO, Mack Robinson, Marty Glickman, Nazi Germany, Ralph Metcalfe, Sam Stoller, William Hybl. Bookmark the permalink.